Posted March 21, 2019 by Josette Farrell in News. 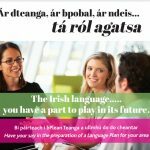 The Coiste in conjunction with a language Planning Officer are progressing the work and as an initial stage a survey of residents in the area is being carried out. This is being conducted from March 10 to 24 to ascertain the support or otherwise for the language in the area. There are hard copies of the survey document available in the Claregalway Hub and some door to door surveys will also be undertaken. The survey is available on line at www.surveymonkey.com/r/eachreidh. 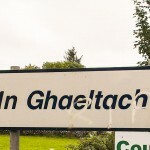 The Coiste are appealing for a good response from the community to complete the survey in order to help in the formulation of the plan and provide a template going forward for the development of the language in the area and to retain the Gaeltacht status.